Our Clinical Aromatherapy Consultant, Dr. Joie Power, formulated all of the blends offered by Artisan Aromatics. We create and bottle all at our shop in North Carolina USA. 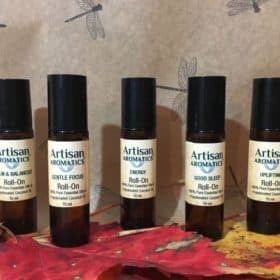 Each Essential Oil Roll-On is diluted with Jojoba for direct use on the skin. The unique Essential Oil Blends developed by Our Clinical Aromatherapy Consultant, Dr. Joie Power have been diluted in Jojoba to the correct proportions for direct use on the skin. Easy to use…Simply remove the cap, invert and roll onto your skin. 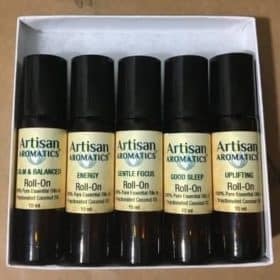 Aromatherapy Roll-On Blends make great gifts particularly for friends and family who may be new to Essential Oils. Caution: As with anything new that is applied to the skin, please test in a small spot to ensure that it is right for you before applying to larger area.